I’ll be in Balingup this weekend (Sat 14th and Sun 15th July) for the Telling Tales Children’s Literature Festival. Last year was my first time at the festival, and I was really impressed with the way the community runs it and gets behind it. It’s not that far a drive from Perth city – only an hour south-east of Bunbury – and well worth the visit. There’s a great lineup this year, including Sean E Avery, David Caddy, Deb Fitzpatrick, Elaine Forrestal, Gabriel Evans, Sonia Martenez and Chris Nixon. 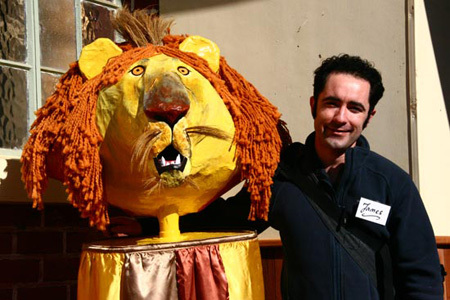 “Telling Tales in Balingup is an exciting children’s literacy and story telling event. the next event will be held on Saturday 14th and Sunday 15th July 2012. Held on the middle weekend of the July school holidays. The event is designed for primary school aged children 4yrs – 13yrs. A host of published WA authors and illustrators will present interactive workshops throughout the weekend. A multiple of sessions are on offer at any given time so you can select a session which best suits you and your children. Children will also be able to learn the art of traditional book binding, and take home their very own book. I’ll be doing some talks and workshops on both Saturday and Sunday, talking about my new book In The Lion! Next Next post: There’s a lion on the loose!